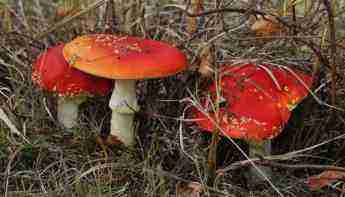 Fly agaric mushroom is a highly dangerous but very beautiful plant. In autumn, in the south of England, they can be found in abundance. They are particularly good this year 2009, simply sheets and sheets of them ... and their red colours seem to be even richer and brighter and more glowing than ever before. Sprinkle the poisonous mushrooms into a bowl of milk in the dairy or kitchen, out of reach of any pussycats that may be hanging about waiting for their sup. Any flies that sip the milk become lethargic and can be easily swatted. It would seem that it's not only humans that just love to get a trifle high. Reindeer apparently just love these mushrooms. If you want to round up a herd of wandering reindeer, it's reported, all you have to do is scatter pieces of these mushrooms around. They absolutely adore them. Their nerves become highly stimulated and they start leaping about until exhausted. Exaggerated physical movements like this are typical in mammals. 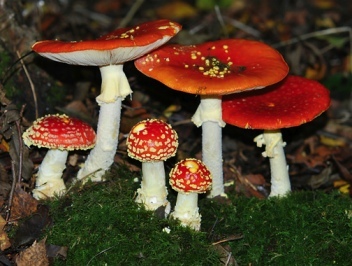 Fly agaric mushroom is found in the south of England in the autumn. FRIDAY FUN: Get high with a little help from your friends. About half an hour after swallowing these mushrooms, the muscles of human beings start to writhe and contract and twitch convulsively. Vomiting is common, followed by severe dizziness and a deep sleep or stupor, during which time you would have vivid dreams and visions; and on awakening, if you wakened you'd be filled with elation and would also being to leap about to the amusement of friends and family. Rather, try a glass of red wine. At least that will help lower your cholesterol, as well as your state of consciousness, though in large quantities alcohol is probably just as toxic. Recommendation; stimulation of the brain, using the eyes only is advised. Anything more absolutely avoid! These are definitely not healthy living mushrooms. Just a bit of relaxing fun before your weekend. Why on a chiropractic help site? No reason, just saw them whilst wandering in the forests near Giggers Green, Kent. Mmm, what an interesting name; I wonder if the person who named the hamlet had had his fill of mushroom hallucinogens that morning. Well, I suppose leaping about is good exercise. Have a good weekend, take a good walk in the woods, good for the bones and the heart. Look only at the mushrooms; don't touch. 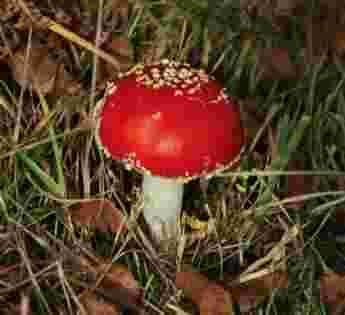 Healthy living tips will give you some ideas about how to reach a happy, healthy eighty with all your marbles and joints intact; it doesn't include fly agaric mushroom for breakfast!